"You see too what is the situation of these days. We are facing very important must-pass obstacles in everyone's interest. I am faced with a document that will get the majority vote of the parliament in order to move forward…"
These are some of the things that Silvio Berlusconi said by phone to his friend Pierino Gelmini, on the party of the drug abuse rehabilitation centre Comunità Incontro (Community Encounter), where the undersecretary of Prime Minister Carlo Giovanardi was awarded with the "Madonna of the smile" prize. Apart from the only logical explanation for such recognition – if the Madonna thinks of Giovanardi, she can only laugh… - I have another scoop. I could write a post on the meaning of coherence in President of Chamber of Deputies Gianfranco Fini and his friends voting the confidence to a person like Silvio, after having finally started to separate from him. However, as I already said in the past, if they were coherent they would never have been allied with Berlusconi. But let’s back to the scoop I am going to publish. The following are video and text of tomorrow Silvio’s speech to Italian Chamber of deputies. It seems like a madcap farce, isn’t it? Anyway, what is not in this story? Mariastella Gelmini: (entering with a scream of terror) Silvio, they want to kill you! You are accountable for the decline of the country. Silvio: I am accountable for the decline? Mara Carfagna: Silvio, persuade the Parliament with one of your usual talk. (To Gelmini and Carfagna) They liked that word… before. The people of freedom, when hear a difficult word, love you… Now again: more beautiful and superb than before. Silvio: More beautiful… thank you! People of Freedom: Thank you! 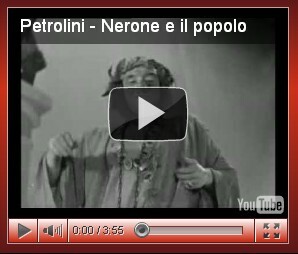 Free adaptation of "Nerone" (Satire on Roman Emperor Nero), by Ettore Petrolini. The News: Berlusconi looks to win confidence vote.